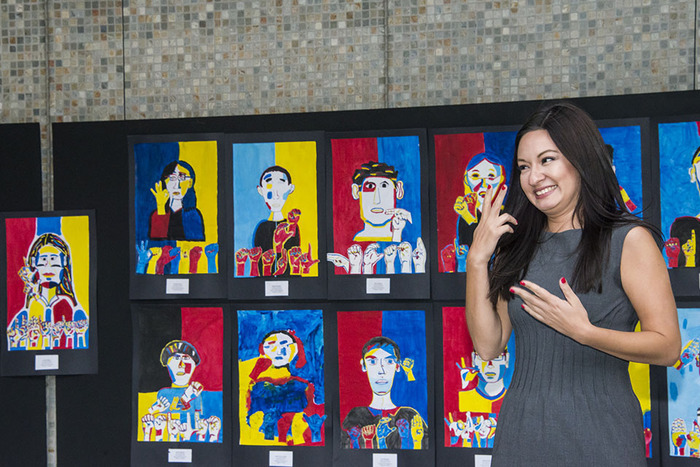 Former West Wing Receptionist, Leah Katz-Hernandez, looks at students' art outside the Valley Performing Arts Center. Photo by David J. Hawkins. Katz-Hernandez shares the story of how her parents met. Ricardo Hernandez and Lizabeth Katz met at CSUN before graduating in the 1970s. Photo by David J. Hawkins. Katz-Hernandez delivered her presentation to a room of approximately 250 people. Photo by David J. Hawkins. California State University, Northridge welcomed former West Wing Receptionist, a position commonly known as Receptionist of the United States (ROTUS), Leah Katz-Hernandez to the Kurland Auditorium on April 25. 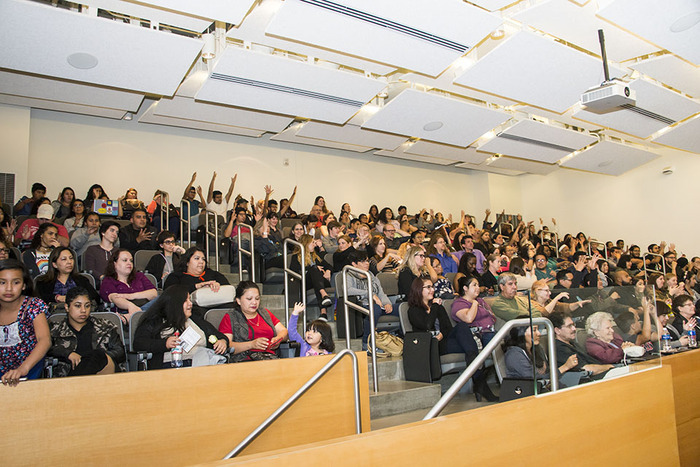 Katz-Hernandez, a deaf woman of Mexican-Japanese heritage, delivered a presentation themed The Future Is Female, Intersectional and Deaf to a room of approximately 250 people, focusing on the dynamics of working and advancing in politics as a deaf, multiracial woman. Katz-Hernandez was a volunteer for the Obama-Biden 2008 and 2012 campaigns, a part of the inauguration team in 2012, and a research assistant for Michelle Obama. Her service for the Obama administration culminated in the West Wing receptionist position she held from February 2015 to January 2017. She shared what it was like for a deaf person in politics. 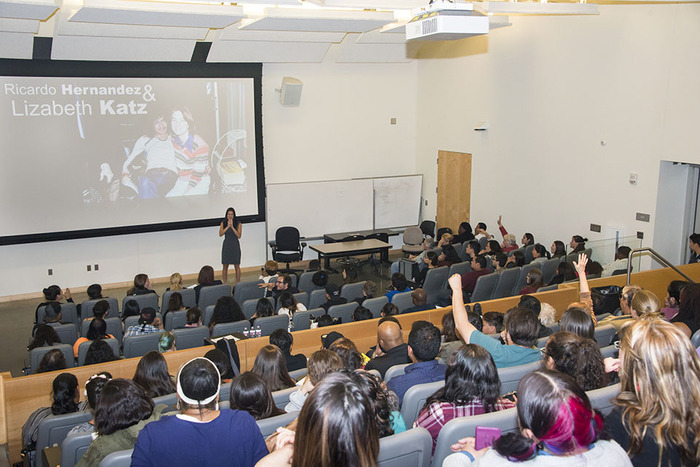 The presentation at CSUN was the first stop of Katz-Hernandez’s tour. She said she chose to do this because of her personal connection to the campus. “Both of my parents, Ricardo Hernandez (hearing) and Lizabeth Katz (deaf) are CSUN alumni who graduated in the 1970s. They actually met here,” Katz-Hernandez shared. There was a question-and-answer forum after the presentation. An audience member asked her if she would ever run for political office. “Someone once told me that there are two types of people in the world — elected officials and staffers. I truly believe that I am a staffer,” Katz-Hernandez confessed. Katz-Hernadez ended by offering several suggestions for young professionals, both hearing and deaf.